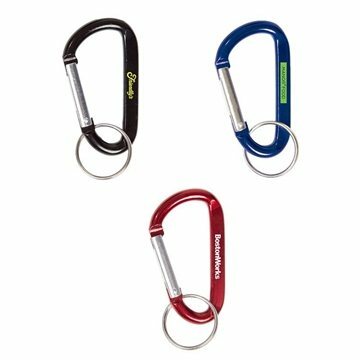 A Carabiner Key Tag of size 2 3/4" with split ring attached. Carabiners cannot be used for climbing. Awesome! Very durable and also the perfect size to place other free gifts in. I own several LED functional items. This really is undoubtedly the very best in terms brightness and overall effectiveness du to the lightweight. It's also perfectly produced from an alloy of aluminum. Everybody who received one loved it! These were an enormous hit. It's good quality at a great rate.